I had an evening of sewing to myself last Friday night while everyone else was at the Cal football game. I started out with a goal of adding a column of blocks to En Provence. I ended up finishing the Mostly Manor top instead. I made the blocks last Fall, put them together at the recent BAM retreat, cut the borders at Craft Night and now they are a quilt top. 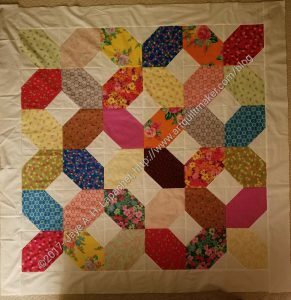 I had the borders cut and when I ran out of Triple Star pieces to use as leaders and enders, I realized I could add the borders as leaders and enders in between sewing the En Provence blocks together. Once the borders were on, I further realized that the back wouldn’t be much more work. I had some hoops to jump through (making the label), but with that done quickly and a few large pieces of backing fabric on hand, I had the quilt ready to take to Colleen. I brought the quilt with me to PIQF and dropped it off at her booth, which saves me a drive. YAY! I am so glad this project is moving along. Perhaps it will be ready for the giftee for Christmas or shortly thereafter.